In today’s digital economy, your company’s success depends on your ability to manage fast-growing volumes of information. Documents allow you to transform raw data into usable knowledge. The print management solutions we provide will increase your company’s profitability and efficiency by streamlining the flow of information through your business processes. With Managed Print Services (MPS), Boring reduces frustration, delivers a better work experience for employees and an improved return on investment for your organization. The initial phase of the managed print services process is assessing your business’ digital environment. A Boring representative will discuss your organization’s print needs and, over a given amount of time, evaluate the usage on each machine and determine the actual costs to operate your equipment. 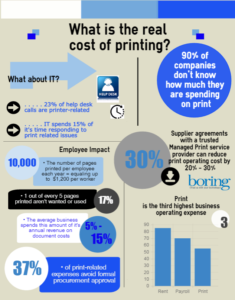 Boring’s Managed Print Services (MPS) philosophy is that the best way to reduce your printing costs is to reduce print volumes. Secondarily, every organization should incorporate the most cost-effective devices for each of their needs. Our MPS solutions give our customers the ability to manage and control their output costs as well as track and bill back any of these costs to departments, individuals or clients. Quite often no new hardware is required and the ROI for MPS customers is significant. Imagine sending a print job out and being able to retrieve it from any device on your network! No longer will you have to return to your desk in case of an equipment failure, lines at a device or a problem in the print queue. Being able to have your technology decide the best, most cost-efficient device for each unique job can also be accomplished. These abilities eliminate unnecessary prints and paper costs as well as increase employee satisfaction and productivity. Control – A solid managed print solution will offer strong management control, which allows a company to know and be able to predict their annual print costs. Savings – MPS provides significant savings through a bundled solution, optimizing hardware in an office environment and leveraging an organization’s buying power to its maximum potential for typically 20%+ savings over the lifetime of the devices. Cost containment and reduction – In all areas of business, organizations are on a budget and are looking to “contain” costs. The purpose of MPS is to deliver a predictable and controllable print environment so that companies can stay within budget and control the growth of costs over time. Continuity – The more devices a company has that are similar (i.e. manufacturers, makes, models), the easier it is to reduce cost, inventory, and the number of contracts to manage. In addition, an employee’s knowledge of a machine does not vary from machine to machine. Long-term strategy – When looking at managing your document environment, you need to think long term. Developing a long-term strategy with a consultative partner ensures that your business will meet its print goals. Consolidation – When you consolidate vendors, invoices, devices, and inventory, the results is almost always positive. MPS seeks to find “the right size” devices for companies and match the equipment to the business’ actual needs. “Right-sizing” is often a task when the most savings are discovered. Regular, detailed reporting and ongoing consultation – Analysis of print costs is something that is often overlooked. Not reviewing where money is being spent on printing can be very costly and also affects end-user happiness and productivity. Get a FREE Print Analysis Now! Simply complete this form and one of our print experts will contact you and analyze your current print environment. We can then help you determine if Managed Print Services is a good fit for your company. How challenges does your company experience with print?